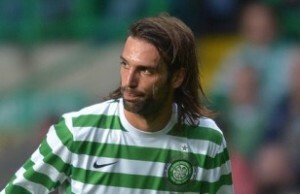 Georgios Samaras says he will remain with Celtic for at least another season. The Greece international striker has a year left on his current Parkhead deal and insists he will honour that before making a call on his career somewhere down the track. “I have one more year of my contract and hopefully I will be here next season,” said the 28 year old who joined from Manchester City in 2008. “Six years is a lot but it has gone so fast and when you feel good at the club, people are looking after you and you feel you are part of a big family, I cannot see a reason to leave. “But it is too soon to speak about a contract. When they are ready and I am ready then we will have a chat.